If you've always wanted to learn how to scuba dive, discover new adventures or simply see the wondrous world beneath the waves, this is where it starts. No matter what your challenge either physical or mental, there are usually techniques that can overcome them. We always aim at integrating a challenged diver so that they can achieve PADI Open Water Diver as this is the most recognised scuba certification and has introduced millions of people to the adventurous diving lifestyle. 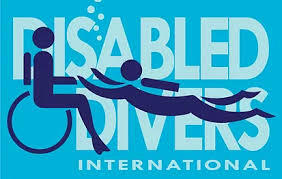 If a diver can`t achieve certain performance requirements then this is where Disabled Divers International certification can help achieve your diving goals. All the usual diving skills, breathing underwater, mask and regulator skills and all the rest. Adaptive techniques may be used to accommodate any unique challenges. Diveworld has specialist staff on hand to work with each diver to overcome any difficulties. The whole process should start with a PADI Discover Scuba Dive with us in confined water and we can assess and discuss any unique challenges you have and, together, how we can overcome them. In the PADI Open Water Diver course and DDI courses , you learn to use basic scuba gear including a dive computer, and standard accessories and adapt any equipment to your unique needs if required. The equipment you wear will be chosen by a DIVEWORLD professional to ensure your comfort throughout the course. Why not add the PADI Dry Suit Specialty to the basic course to increase you comfort while training? PADI offers a variety of home-study materials for the Open Water Diver course - traditional manual and DVD package. PADI has enhanced this program by offering the learning material in an E-learning environment via the internet and offline on a tablet, you choose which method suits your learning style. PADI's Open Water Diver materials cover what you need to know about basic scuba diving skills, terminology and safety procedures. For each concept you'll read a description and watch a video demonstration. Then you'll jump in the pool to practice these skills with your instructor. We may discover unique and individual ways of achieving skills tailored to your own personal strengths and capabilities rather than mainstream methods. Minimum age to embark on training is ten. Every diver must have a standard medical form signed as fit to dive by a physician prior to starting training.